Tenzing Rigdol, ‘Our Land, Our People’, 2011, site-specific installation, 43 x 43 ft. Image courtesy Rossi & Rossi and Bhuchung D. Sonam. 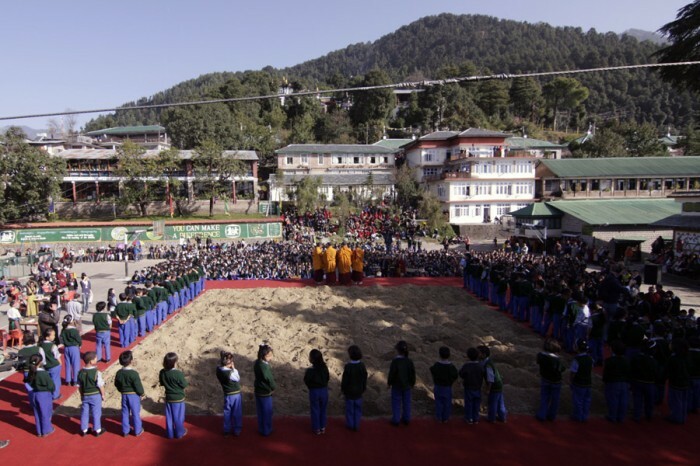 In 2011, artist Tenzing Rigdol surreptitiously moved over 20,000 kilograms of dirt from Tibet into the exile community of Dharamsala, India for an installation titled Our Land, Our People. Thousands of Tibetans in the area came to view and touch the land, some with memories of a Tibetan landscape from their youth, others who had never set foot in the home of their ancestors. This work challenged the viewer to rethink the terms “location” and “landscape,” terms that usually imply a rigid scene or space. Here though, perhaps the term dislocation is more relevant. 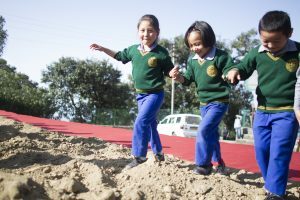 Rigdol’s work further addressed the themes of displacement (quite literally) and identity, as the young Tibetans in India walked on their homeland for the first time. I’ll return to Rigdol’s installation later; first, I turn to works created by artists both within and outside of Tibet that evoke these same themes through landscape imagery in more traditional formats. 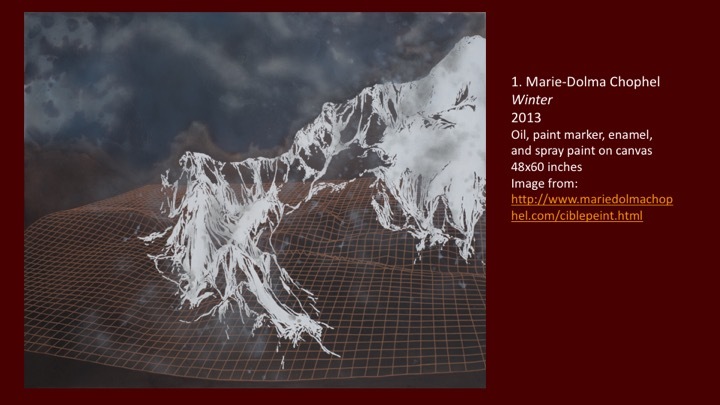 Marie-Dolma Chophel’s Winter (2013) suggests a landscape that is neither real nor imagined. The viewer encounters the snowy peaks associated with the so-called “roof of the world,” as Tibet is often called, though they are by no means limited to that association; the title certainly does not suggest a specific region. The peaks do not rest on a recognizable landscape. Rather, they float above a world of gridlines that echo the contours of topographic maps. The result is a landscape that is other-worldly. The inclusion of this image in the 2014-2015 Anonymous show (one of the more recent exhibitions to showcase contemporary Tibetan artists) is the only real factor linking the work to Tibet; this landscape image that otherwise seems without geographical reference now becomes a part of the dialogue that asks what, exactly, do we mean by “Tibet”? The Westerners who encountered the isolated monastery described monks, clothing, and a lifestyle that became associated almost immediately with Tibet by readers of the book. The term itself became a synonym for “utopia,” even though the Shangri-La of Lost Horizon was not, in fact, without ominous associations gradually discovered by the characters in the book. When we think about a mountain we see it as one of the most immutable landscape form(s). In this painting the mountains are falling on the grid, painted like a thin lace, like a veil suspended between the sky and the topographic grid. It is like a memory that fades, expressing dislocation of place and identity across space and time…For a public seeing my work in another context it would be a mountainous landscape inspired from anywhere in the world. It doesn’t change its sense; there is just not any suggestion of a precise geographic reference. And that’s what I find interesting: making an art that would allow the viewer to interpret and feel it with its own references. As a scholar of traditional Tibetan art, I immediately read the gridlines in Winter as an allusion to those guidelines and gridlines that form the basis of all Buddhist images. The artist said this was not her intention, though it does create another cultural reference point to Tibet. That reference further embeds the work among the other Anonymous show images, many with figural representations that directly indicate Tibetan Buddhism. Even so, the author’s stated avoidance of a Tibetan signal contrasts the landscape imagery of several other artists. 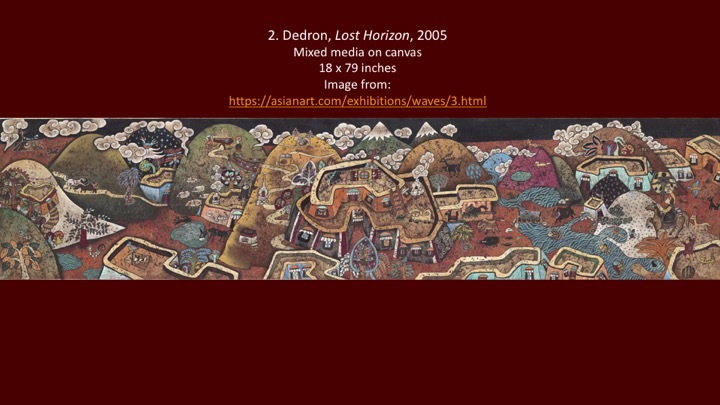 Lhasa-based artist Dedron directly referenced the Shangri-La of Hilton’s novel in her 2005 painting, Lost Horizon. Lost Horizon’s panoramic landscape image is idyllic. Like Chophel’s work, Dedron’s imagery seems to exist somewhere between a real and imagined scene. The brightly colored mountains and happy animals certainly are cheerful. The rounded forms create a tranquil scene and allude to the types of clouds found in more traditional Tibetan paintings. However, the title’s direct reference to the origin of Shangri-La is ominous, much like the utopia of James Hilton’s novel. 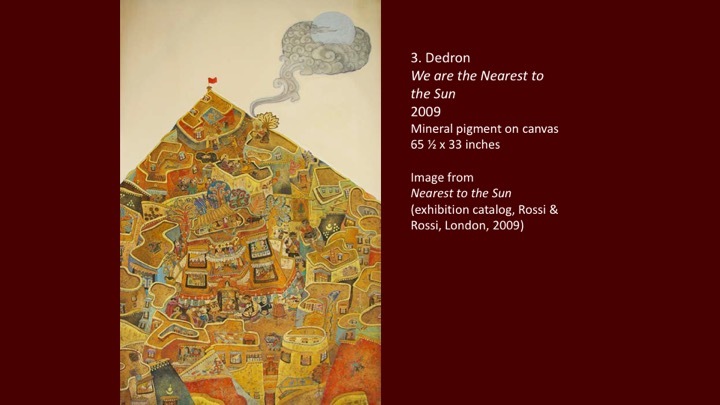 Dedron’s first solo exhibition in 2009 was titled Nearest to the Sun. The choice of this title again highlights location, specifically that of Tibet. It places Tibet in a position of physical height, but also in an elevated status referencing a higher spiritual plane. The painting from which the exhibition’s name was chosen is similarly titled We Are Nearest to the Sun (2009). One triangular peak dominates the canvas. Neatly contained within this mountain are Tibetan structures, animals, and human figures in profile, again all created in the same rounded and brightly-colored forms found in her painting Lost Horizon. The artist’s fluid lines create a space where the architecture, land, and figural imagery blend together, forming a pattern within the mountain. The blank space at the top of the canvas differs from the rest of the image and other painting in its starkness, though it does highlight the cloud emerging from an offering into a neatly formed oval surrounding, presumably, the sun. There are references to religion, including the Geluk hat of one figure, prayer flags, offerings, and tiny Buddha figures, yet the general appearance of the painting is one that showcases the landscape—the location—over any other theme. Like Dedron’s work, Lhasa-based artist Gade’s New Tibet (2006) suggests a landscape of Tibet, though whether the scene is meant to show contemporary Tibet or a Tibet of the future (or, perhaps something entirely different) is purposefully vague. Also like Lost Horizon, New Tibet is created in a horizontal format to emphasize the landscape elements. Unlike Dedron’s work, however, the edges of New Tibet are rounded and frayed in a manner evoking the well-known palm leaf manuscripts of Tibetan Buddhist tradition. Gade often uses this palm leaf format; in doing so, the artist creates a more obvious link between traditional and contemporary works. In New Tibet, the large mountains and structures are outlined in black. There are a handful of traditional Tibetan elements on the lower left side including conventional Tibetan architecture and a small stupa. Further up and to the right of the image, the elements change to global architectural representations (eg. the Sydney Opera House and the World Trade Center Twin Towers) and so one immediately views this landscape as imaginary. The title and juxtaposition of the real/imagined forms against the traditional palm-leaf shape suggests the same type of counter-traditional trope so emphasized in other works (reimagined Buddha imagery, for example), though it also references the landscape of Shangri-La. “Tibet” is often imagined as an isolated region (it never was), and today is sometimes imagined as a religious state free of the “burdens” of technology (it is not, nor would a technology-free land be desirable). It reminds me of a tourist who, while taking a photograph of a Tibetan monk in front of an altar, asked the monk to put down the cell phone he had in his hand. Presumably, the cell phone did not fit the correct image of Tibet. This painting challenges the viewer to rethink preconceived notions of “Tibet” as location. 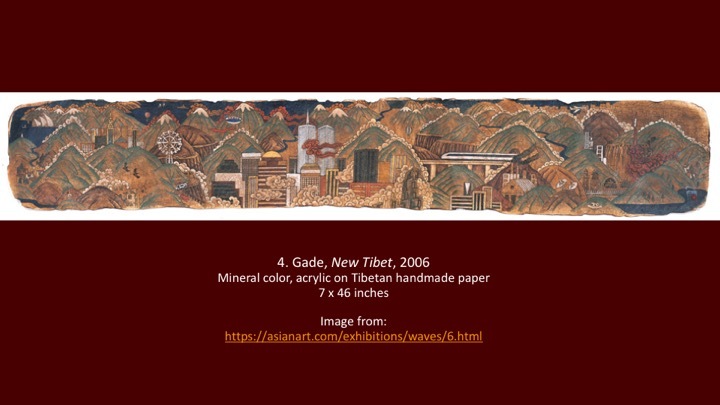 Gade’s magnificently painted panorama, New Tibet (2006), is a futuristic image of Tibet painted subtly on long, thin horizontal paper, shaped to emulate a traditional Tibetan manuscript page. The surreal scene is complete with world trade towers, trains, and UFOs, which appear amid the high mountains and magical clouds that have defined Tibet and Tibetan landscape painting for centuries. Like Gade, Dedron, an artist from Lhasa, has also made a long horizontal painting, Lost Horizon…that depicts the vast expanse of the Tibetan world. Her style, distinctively self-taught, captures with a folk charm and complexity the mountainous landscapes and villagescapes that unfold across Tibet and that have become beloved images of the imagined Tibet, both within and outside its borders. The author does note that this is truly an imagined landscape, but the verbiage of beloved “villlagescapes” unfolding across Tibet does more to reinforce the Shangri-La ideal than challenge it. The passage also references this ideal of Tibet transcending boundaries—it is imagined both within and outside the borders. The Tibetan contemporary artists exhibiting in the past ten years have likewise come from both Tibet and the diaspora; these artists are connected through heritage and a desire to reclaim location, to reclaim the landscape. The video installations of the Anonymous show emphasized a feeling of dislocation, especially in the videos produced secretly in Lhasa. Like Tenzing Rigdol’s work, the production of these works included a great amount of risk for the artist or people involved. The title of the exhibition, shown in New York at the Samuel Dorsky Museum of Art, the Queens Museum, and in Boulder at the University of Colorado Art Museum, refers to the widespread though often incorrect belief that traditional Tibetan art was always anonymous. In fact, many artists were known, they just generally didn’t sign their work (a distinction needs to be made between the two). The stereotype has further colored the manner in which contemporary artists are viewed. The initial premise of the show was to have all artists submit their work anonymously, a tactic that thankfully was revoked with all artists given proper identification. This anonymity certainly proved necessary with regards to the videos surreptitiously filmed in Tibet. One video shows scenes from the Barkhor in Lhasa, an especially dangerous endeavor for the artist filming the scene. The Barkhor is a location that resonates with all Tibetans both in Tibet and abroad for religious and political reasons. As the circumambulatory route around the Jokhang—the temple housing the most-prized Buddha image in Tibet—the Barkhor is the spiritual heart of Buddhist practitioners. Since the advent of Chinese rule in the last half century, the Barkhor has become a political meeting point for resistance. The 1989 protests in Lhasa that corresponded with those at Tiananmen as well as the more recent 2008 Olympic protests occurred in this space, so it is especially well-patrolled for dissidents. It is a landscape, a distinct location that is directly linked with Tibetan identity. The process was completed secretly; the manner in which these tons of dirt were removed from Shigatse in Tibet and brought to India has still not been revealed in order to protect those involved. The end result was certainly more than an installation piece; it was a piece of Tibet that could be held, touched, sometimes even ingested by Tibetans in the exile community. For many, it was their first time connecting to the physical “Tibet” that defines their cultural heritage. 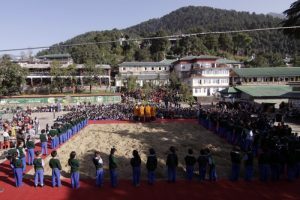 Further solidifying the work as emblematic of both identity and (dis)location is the inclusion of the Fourteenth Dalai Lama’s handwriting on a portion of the displaced sand. The Dalai Lama wrote “Bod,” the Tibetan word for “Tibet.” He labeled the land and, in doing so, reclaimed the land. The land is the landscape; it is the unifying thread of Tibetan identity. Sarah Magnatta is an interpretative specialist of Asian art at the Denver Art Museum (Denver CO). She received her Ph.D. in art history from The Ohio State University with a specialty in Himalayan and South Asian art. In addition to serving as interpretative specialist of art at the DAM, she is currently a consultant for the Thangde Gatsal Tibetan Buddhist Art Digital Collection at the University of Denver and a board member of the Asian Art Association.